As we celebrate the 70th anniversary of Orson Welles’ Macbeth, Getintothis’ Chris Leathley explores the great man’s work. When you think about Orson Welles (and most of us film buffs do regularly think about Welles), you invariably end up feeling conflicted. Welles was certainly talented but he was also never shy about telling people so. A pungent air of braggadocio enveloped his every utterance and anecdote. In a similar vein, Welles was a consummate raconteur, a bon viveur who could charm dinner guests and talkshow audiences with effortless aplomb while savaging friends or lovers with merciless barbarism. Talking of dinner, Welles sure liked to indulge in any gastronomic delicacies available, an inveterate gourmand whose appetites reflected a zest for life and, sadly, a penchant for self-destruction. If ever a man’s culinary tastes embodied his personality, Welles was that man. Primarily, Orson was a master of myth and myth-making, an unreliable narrator of his own life and work. In many ways, Welles’ own tendency to fib when it suited has made biographical analysis a treacherous minefield. That need not be a concern however, especially if, like me, you would question the holy writ that some critics ascribe to the biographical context of filmmakers. Does it matter that Welles’ childhood was equal parts tragedy and eccentricity? Probably, but not to the degree that some assume I’d wager. Instead of dealing with biography (for that you should try the estimable works of Simon Callow, Barbara Leaming, James Naremore and David Thomson), we’ll consider the films. Just the films. That phrase rings hollow and flat when contemplating a cinematic legend as gargantuan as Welles. The titanic dimensions of the man’s art match (if anything could) the vast expanse of his ego. To debut with a movie considered by many to be the finest ever made appears entirely in keeping with this man’s out-sized personality. Nonetheless, if one was to fixate on Citizen Kane (1941), you would be idly ignoring an extraordinary career in the movies which, even posthumously continues to swell to new heights (For new Welles from beyond the grave, check out the soon to be released The Other Side of the Wind on Netflix). Irritatingly, Welles is bizarrely labelled by many as a cinematic supernova collapsing in on itself after the early genius of Citizen Kane. That Welles, constrained by expectations, egoism and treacherous studio hacks, was unable to forge any kind of sustainable filmmaking of any serious meaning. Most, it seems, would prefer the insufferable melodrama of a false narrative, born of a misguided belief that Welles slid into melancholy obscurity. It kind of fits too. Well, it does if you write, watch or read that particular brand of schmaltzy Oscar-bait that we endure far too much of. In fact, nothing could be further from the truth. Welles never stopped making films on his terms. He was intuitively experimental, operating in a raft of different locales and with some of the most adventurous actors available. Moreover, such was the scope of his imagination, that Welles was adroitly capable of veering between striking interpretations of the Bard’s work through to seedy B Movie Noir and on towards esoteric European Arthouse. The fact that he did it with such brio, such easy confidence probably didn’t do much to assuage the grievances of those who felt repelled by his narcissistic persona. It might further explain why so many were prepared to write him off or to question his true legacy to film. Still, it feels beside the point somewhat when faced by such an overwhelmingly impressive filmography. There were, as with any director, a number of influences and frames of view that recurred within Welles’ work. Shakespeare is as good a place as any with which to start. After all, Welles’ first love (and perhaps only true, unadulterated love) was theatre. He made his name as a precocious innovator, responsible for a voodoo approximation of Macbeth that had folks queuing round the block in 1930s Harlem. Welles remained fascinated by Shakespeare throughout his life, adapting his work for the screen three times, with Macbeth (1948), Othello (1951) and Chimes at Midnight (1965). The drama, the wit, the fact that Welles was simply born to play Falstaff, all probably played a part. In spite of everything connected with the, by now thoroughly debunked, auteur theory surrounding Orson, Welles possessed a finely attuned ear that could identify a good yarn when it heard one. And Bill Shakespeare told the best yarns as far as Welles was concerned. Few would disagree. Lest we decide erroneously that Welles was steeped solely in the fusty theatrical tradition, remember that he was just as comfortable with modern storytelling conventions (or indeed, lack of familiar conventions). Who else but Welles would have attempted an adaptation of something as forbiddingly ambivalent as Kafka’s The Trial (1962)? Pigeonhole Welles at your peril. Speaking of narratives, what else is F For Fake (1974) but a filmic translation of post-modernism? Fractured, funny and daring, Welles made F For Fake more than 30 years after his supposed finest hour. Those mournful assumptions about Welles’ career appear ever more facile, the more that you dig. Welles had no time for false nostalgia or slavish adherence to traditional strains of American optimism, cloaked in absurd notions of manifest destiny. That’s not to say that Welles was a pessimist – how could he be and keep going when faced with all those misfortunes, self-inflicted or otherwise? Nevertheless, many of Welles’ movies bestow an icy glare upon a world that just doesn’t ever want to play fair. The funereal decline of The Magnificent Ambersons (1942) epitomises this withering worldview. In the simplest terms available, The Magnificent Ambersons told the story of people who looked backwards so hard and so often, that they failed to look ahead until it was too late. In an age of Brexit and imperial revisionism, this is a failing to which we can all still relate. Just as crucial to Welles the filmmaker was the sense of how much could be done with how little. Budgets, after the unparalleled liberty and largesse afforded Welles in the making of Citizen Kane, were prohibitively restrictive. Consequently, Welles had to cultivate a cinematic metier that was parsimonious without ceding creative ambitions. The Immortal Story (1968), a late period chamber piece by Welles, is an exquisite exemplar of this economical approach to filmmaking. Sparse sets, a minimal cast and an equally effectual use of Satie’s minimalist music alongside some clumsily cheap makeup affixed to a bloated Welles, still do not reveal the full truth of this beautiful film. On more than one occasion one suspects, when critics heard to what extent Welles had had to prune his fiscal outlay, they must have murmured ‘He did it on what? How much? Impossible!’ Just how many of Welles’ movies fell foul of critics, ready only to judge in accordance with industry norms of budget and production? We will never know. One of the reasons that Welles was able to maximise his increasingly rare cinematic opportunities were the teams of supremely talented individuals which he assembled for each production. 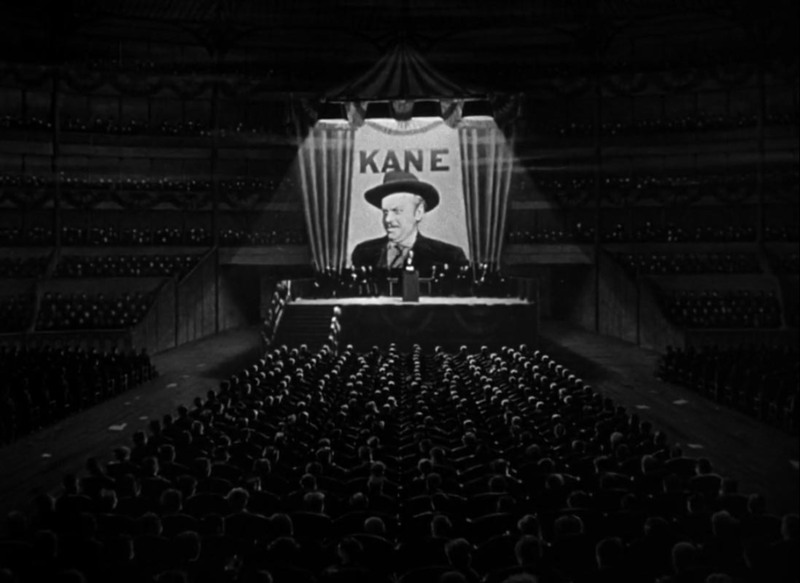 For example, when you think of Kane, do not think just of Welles but of John Houseman, Greg Toland and Herman J Mankiewicz. Technically gifted individuals behind the camera were complemented by stalwarts in front of it. Jeanne Moreau in The Trial, Chimes at Midnight and The Immortal Story, Joseph Cotten in Citizen Kane and The Magnificent Ambersons (and alongside Welles in Carol Reed’s The Third Man (1949), Marlene Dietrich in A Touch of Evil (1958), Anthony Perkins in The Trial and the sensual Rita Hayworth in The Lady From Shanghai (1947), to cite just a few examples. Of course, it isn’t surprising that Welles had an astute eye when it came to performers in front of the lens. He was, hammy or otherwise, a charismatic screen presence in his own right. Set aside Welles’ mania for casting himself in most of his own movies (not always wisely, it has to be said) and you are presented with an embarrassment of dramatic riches. Instead, review the roles that he played in films directed by those who did not always accept without question the gospel according to Orson. The Third Man, Jane Eyre (1943), Compulsion (1959), A Man For All Seasons (1966) and Catch-22 (1970) are just some of the works that he was a part of as a cast member alone. What’s even more impressive is that in many of these screen appearances, Welles essentially played unusual cameos. Yet, when we think of a film in which Welles has featured, however briefly, we think of him before others. One reason for that may have nothing whatsoever to do with his appearance and much more to do with that dreamy velvet baritone. A voice for radio (and who can forget Welles’ forays into that medium!) and a voice for cinema. Ironically, one of Welles’ most potent screen performances might just have been his meditative narration of The Magnificent Ambersons. Welles’ intonations could indeed lift, and often did lift, the most execrable and mediocre material. A voice and actor that could manage to retain a modicum of dignity amidst trash was a marvel to behold. This also points to something that is crucial when thinking about Welles. He never took himself too seriously. The genre-hopping, the infectious enthusiasm, the fervent need to work, all suggest a man who recognised the facile pomposity of cinema and showbusiness. Besides which, Welles had expensive tastes and needed to get paid. The warm, intelligent wit of Welles is evident throughout his back catalogue and helps us comprehend why his decisions to indulge in B Movie fayre were decisions to exploit, rather than be exploited by, those artistic constraints. In the final analysis then, how much of Welles, personally speaking, was in his films? We could identify Falstaff’s genial failure and state, applauding but also with a touch of melancholy, ‘That’s Welles!’. Or might we instead chuckle at the cringing accent but respect the noble naivete of Michael O’Hara and smile, gesturing ‘I’m afraid that he might be Welles’? On more despondent days, we could whisper ‘No. He’s Welles!’ when faced by the swarthy grotesque that is Hank Quinlan and turn away, in sympathy and disgust. God forbid that there should be nights that lead to us pointing a shaking finger and acclaim the ruthless, predatory Harry Lime as Welles. The answer though, is obvious but no less genuine for that. Welles was all of them and none of them, such was the richness of his talent and the opacity of his self-mythologising life. It is a marvellous testament to Orson Welles that we each have a different Orson in our mind’s eye and that each rings true. The tragedy of a tacked-on ending by the studio because of their concern over the mordant tone should not detract from this masterpiece. Mercury Theatre die-hards like Joseph Cotten and Agnes Moorhead were joined by Anne Baxter and Tim Holt for a rueful examination of class privilege, the rapacious march of industrialisation and self-destructive narcissism. It is an elegiac piece, totally out of kilter with the morale boosting cinema of the early 1940s but refreshingly modern by comparison with our current sensibilities. It doesn’t do to dwell on what could have been with regards to the movie’s stilted, fraudulent finale. Instead, be content with the horrifying spectacle of Holt’s maniacal hatred of his widowed mother’s suitor, Eugene, twinned with his equally hopeless desire for Eugene’s daughter Lucy. This is all shadowed by a fin de siècle America that has little room left for a navel-gazing aristocracy, too proud to work and too stubborn to beg. All that is left is a downward spiral of loss and recrimination. It is as memorable a film as any that Welles ever made. Welles had attempted Film Noir previously with The Stranger (1946) and The Lady From Shanghai (1947) but neither matched the virtuosity of Touch of Evil. The film depicts a Mexican border that teems with drugs, corruption and licentious depravity although, unlike other movies, it also peels back the veneer of respectability so often attached to the boys in blue. Welles, as the monstrous Hank Quinlan, is the epitome of empowered bigotry, a detective determined to pin crimes on helpless minorities in the wake of an audacious drug-fuelled assassination. It is a measure of Welles’ depth as a performer that he is able to gift this repugnant character a level of pathos and vulnerability that would have been risible had another actor been resident in the role. For a movie made well past Welles’ Hollywood heyday, Touch of Evil boasts a surprisingly muscular cast of Janet Leigh, Marlene Dietrich, Charlton Heston and Akim Tamiroff. Moreover, the film offers a masterclass in versatile cinematography, not least with the justly famous opening sequence. A firm cinematic rebuttal to those who labelled Welles’ career after the 40s as a study in failure. The Trial was made in Europe and was the beginning of an extended period of exile for Welles. Nevertheless, it allowed Welles creative opportunities that simply were not available in Hollywood at that point. In bringing The Trial to the big screen, Welles faithfully transcribed the existential dread and eroticised mystery of Kafka’s unfinished novel. Josef K’s odyssey through a baroque bureaucracy, after being arrested for a crime which is never revealed, is brought to cinematic life via glacial photography, eerie locations (including the inspired choice of the ruined Gare D’Orsay) and a tightly coiled performance by Anthony Perkins as the hapless protagonist. Jeanne Moreau, Romy Schneider and indeed, Welles himself, add further brutal lustre to a film that bore painful relevance to many in 1960s Europe. During an era of global filmmaking in flux and revolution, Welles proved that he could still blaze a unique trail. Only Welles would have the sheer chutzpah to attempt to condense elements from four different plays by the Bard into one film. Indeed, only Welles could manage it with such success, as the Henriad cycle, with all its tonal shifts from humour to tragedy and back again, is lovingly adapted. In essence, it details the growth of young Prince Hal from irresponsible adolescence into a statesman-like austerity, necessary to rule but devastatingly sad nonetheless. In fact, only those around Hal, such as his father Henry IV and Sir John Falstaff (played with gregarious effervescence by Welles himself) fully appreciate the price that Hal will pay for his ruthless ambition. Chimes at Midnight features a vibrant brand of thespian dialogue that feels vital rather than archaic, avoiding a common failing amongst some more contemporary Shakespearean adaptations. In addition, it contains some of the most effectively filmed medieval battle scenes ever committed to celluloid. Once more, Welles was blessed by a starry cast, comprising of Jeanne Moreau, Ralph Richardson, John Gielgud, Fernando Rey and Margaret Rutherford. Their consummate skill and courageous embrace of Welles’ vision makes Chimes at Midnight a majestic work of cinema. Welles considered Chimes at Midnight to be his personal favourite of all his films and it is easy to see why. Welles’ final completed film and certainly his most bravura effort, F For Fake interweaves an attempt to document the life of art forger Elmyr de Hory with a consideration of authorship and truth. Instead of a linear narrative, we end up with meandering meditations on Hory, hoax biographer Clifford Irving and Welles’ own work. In short, it is impossible to identify just one point of ingress for this film. Its motive and purpose remain elusive. In other hands, that attitude might lead to intellectual high-mindedness and dull proselytising but in Welles’ hands, F For Fake becomes a garrulous take on the ‘shaggy dog’ stories that inhabit universes far more extensive than simply cinema. Welles is at his most amusing as he performs various sleights of hand (literal and thematic) with a knowing wink at the camera. A surprising and imaginative conclusion to one of the great cinema careers.